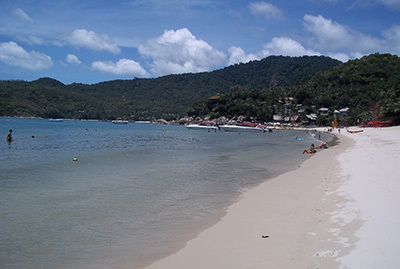 There are those who book their rooms in Thong Nai Pan well in advance, and there are those who for one reason or another wait until November or later to try and get a coveted accommodation in Thong Nai Pan Noi or Yai for the Christmas holidays. Of the two key days – Christmas Day and New Year’s Eve – the hardest to book is New Year’s Eve. This is no doubt due to the popularity of the New Year’s Eve Party at Haad Rin. If you are still looking for a room for either of these dates, time is running out. In Thong Nai Pan Noi all the cheaper rooms have gone for New Year’s Eve. Phuwadee and Thong Tapan Resort still have rooms for Christmas. The best you can do for New Year’s Eve in Thong Nai Pan Noi is Buri Rasa. If money is no object (most of us wish) there are still pool villas available at Santhiya and Rasananda. The situation is a little better on Thong Nai Pan Yai. Both the Four Resort and Starlight Resort have rooms for Christmas and New Year’s Eve. Paan Banburi, Nice Resort, Dreamland Resort and Havana Beach Resort have rooms available for Christmas. These will go soon as they are in the mid-range category. So if you aren’t a millionaire I should book soon to stay in Thong Nai Pan during Christmas and New Year. For the latest updates on room availability during the Christmas holidays 2015/16 visit Thong Nai Pan Magazine. They have an available rooms update on their front page.